As the school year winds down, students become restless. Summer is so close that they're thinking about it, but they need to be productive in school as well. 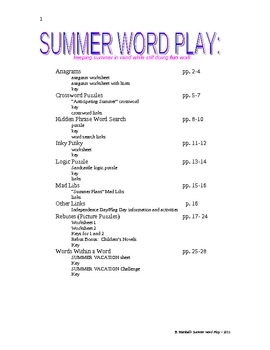 "Summer-themed Wordplay Fun" has original materials: anagrams, "Inky Pinky", crossword, word search, Mad Libs, rebuses and more. There are also links to additional games and activities all with a summer theme. Activities vary in difficulty, and two different versions are provided for a couple of the activities.They are a great idea to use during the last week or two of school. They let the students think about summer, but invite them to do critical thinking as well. Adapt any activity to best meet the needs of YOUR students. Good luck and have a great summer!